The Astros weren’t supposed to contend until 2017, but they’re in first place and starting to turn heads. How did they get here? And can it last? To help us solve those mysteries, here’s the story of the Astros’ season, as told through 10 stats. On June 11, 2012, the Astros were 26-34, which put them on a 70-win pace. Coming off a 56-win campaign and a spring in which they’d earned extremely pessimistic projections, that .433 winning percentage qualified as a pleasant surprise. I picked that time to write an article about how Houston, through almost 40 percent of its season, hadn’t been historically terrible. From that point forward, the Astros went 29-73 (.284), which over a full season would have put them a 2003 Tigers squad away from being the worst team since the ’62 Mets. That was the sort of inadequacy we expected from a team that was strategically tanking in the short term. In the three years since, the Astros have gathered their strength like Sauron during the Third Age, improving to the point where a pleasant surprise means something more than a chance to be better than abysmal. Now, it means having a realistic shot at a playoff spot. The Astros are 18-10, with a five-game lead in the AL West that’s second only to the Cardinals’ among division leaders. After adjusting for the offensive environment, their lineup, pitching staff, and plus-22 run differential all rank sixth in baseball through Wednesday. Their playoff odds, according to FanGraphs, are north of 40 percent — and by recent Astros standards, a coin flip feels the same as a lock. Since Opening Day, only the Yankees have increased their odds of making the playoffs, and winning their division, as dramatically. And the Astros still have two years until they’re scheduled to win the World Series! With his team now eight games over .500, GM Jeff Luhnow’s January prediction of a winning season sounds conservative. But it’s important to remember that it’s still early, and that the Astros haven’t actually earned anything yet. Even the 70-win 2014 Astros had a 27-game stretch in which they went 17-10 with a plus-24 run differential, not far from what this year’s team has achieved. And last season alone, six teams that missed the playoffs (Toronto, Tampa Bay, Milwaukee, Cincinnati, Seattle, and Colorado) had 27-game stretches in which they won at least 18 games while posting better run differentials than Houston has recorded. The Astros’ hot start, fueled by a 10-game winning streak that the Rangers snapped on Monday and buried with a three-game sweep, seems especially significant because it’s coming at the start of the season and because we haven’t seen Houston contend in so long. But this is still a touch-and-go team trying to contend with a roster that’s not fully formed. While we wait for time to reveal the rest of the plot, we can consider the questions we ask about every team that’s surpassed expectations: How did it get here, and where will it wind up? To help us solve some mysteries, here’s the story of the Astros’ season, as told through 10 stats. Note: Team records, standings, and playoff odds are up to date through Wednesday’s games. All other stats are current through Tuesday’s games. Batted-ball velocity and distance data is via Baseball Savant. 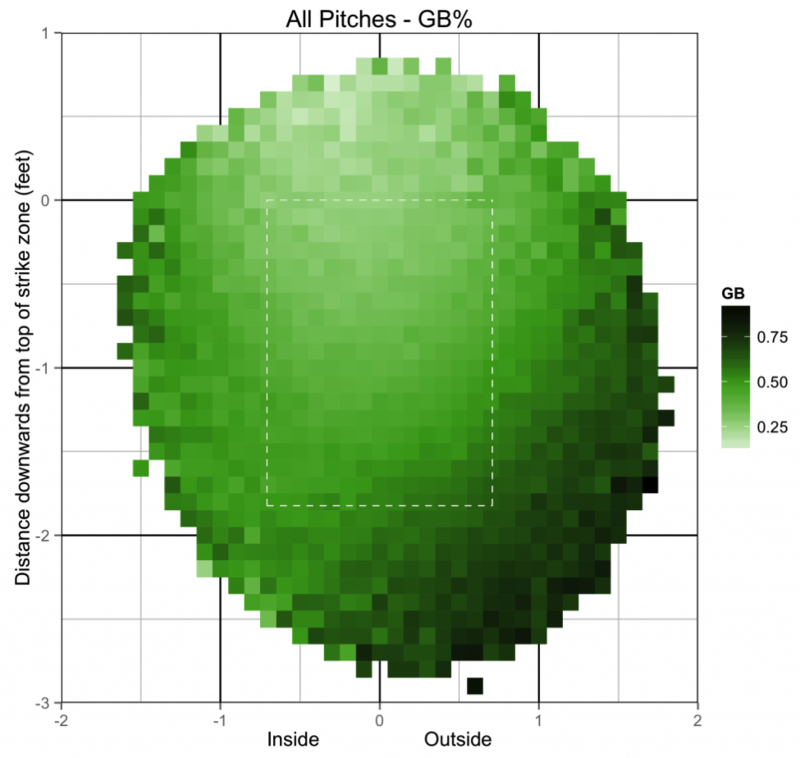 That rate is 1.8 deviations above the average percentage of pitches thrown in those zones. In other words, the Astros have lived low and away. Houston’s Opening Day starter, Dallas Keuchel, is the king of the low-outside corner: 40.8 percent of his pitches have passed through one of those sections, and no pitcher this season has thrown more pitches to righties in Zones 9 and 14. It’s obvious that avoiding the middle of the plate is a smart approach for pitchers, but the full significance of the Astros’ low-and-away fixation takes a few more stats to explain. 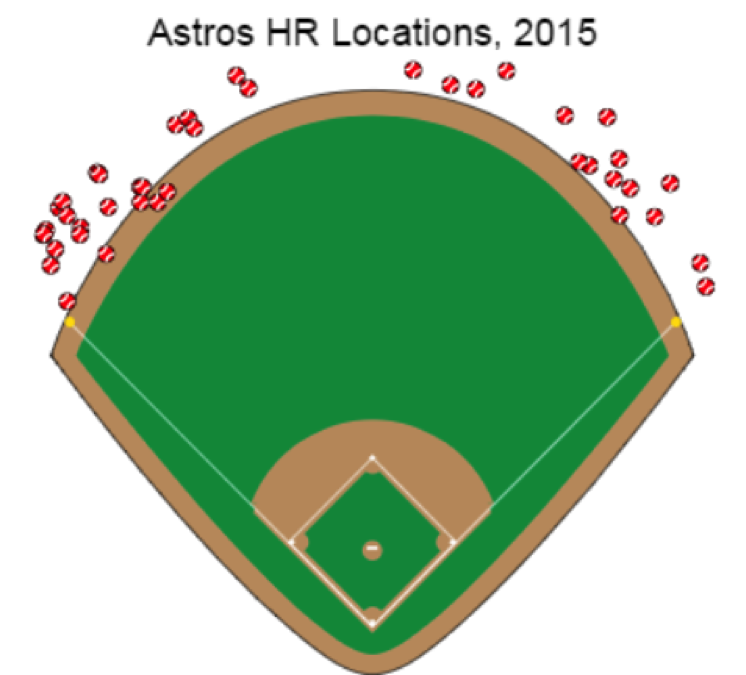 The average velocity, in miles per hour, of the batted balls the Astros have allowed — the second-lowest of any staff. There’s reason to think this isn’t random. 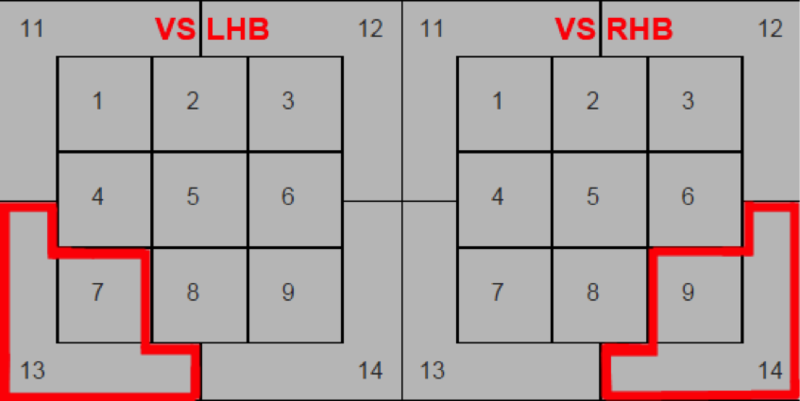 In 2009, Baseball Analysts author Dave Allen made the below heat maps (also from the catcher’s perspective) of average batted-ball velocity by pitch location, using HITf/x data1 from April of that year. The numbers on the y- and x-axes indicate feet from the ground and from the center of the plate, respectively, and the paint-sample scales on the right-hand side are the velocity color codes. “Hot” areas are regions where pitches tended to yield harder contact. A proprietary source of ball-tracking information, similar to the Statcast data Major League Baseball Advanced Media has made available this year. 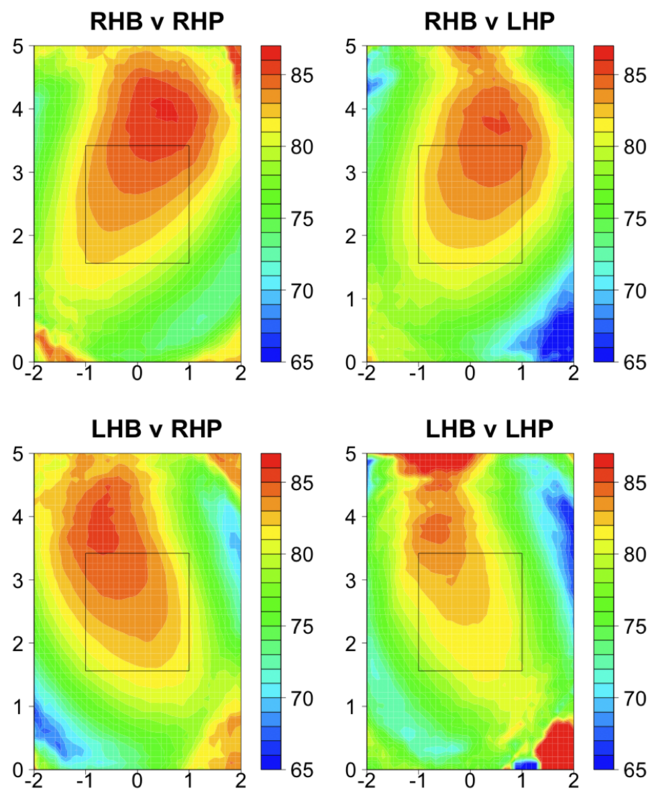 In all of these images, the low-outside corner of the strike zone has the largest low-speed area — ranging from yellow to green — while farther down and away holds big swaths of blue. Those results seemed to suggest that pitchers who consistently hit those spots would be rewarded with weak contact and, in turn, better results. That relationship can’t completely explain how the Astros have allowed the third-fewest runs in the AL, but it’s probably part of the picture. As we would expect, given Keuchel’s fondness for those spots, he’s an exit-speed standout. Among the 148 pitchers who’ve allowed at least 30 balls in play, only Chris Sale has allowed a lower average batted-ball velocity than Keuchel’s 83.6 mph. There’s usually a penalty associated with a lack of velocity, but the Astros have found a way to minimize it. One way they compensate for throwing the slowest fastballs is by also throwing the fewest four-seamers, topping or coming close to the top of the leaderboards for sinker, slider, and cutter rate instead. But the Astros have another secret to surviving low velo. In a sense, the Astros are adhering to a pitching cliché: “hard in, soft away.” They don’t have hard, so they go away often. But something else sets them apart: Even when the Astros do throw the closest thing they have to heat, they still aim low and away, placing 30.5 percent of their fastballs in the four zones discussed above — the most in the majors, and 2.2 standard deviations above the league-average rate. They’re pitching away, period. Counterintuitively, this might actually make sense. 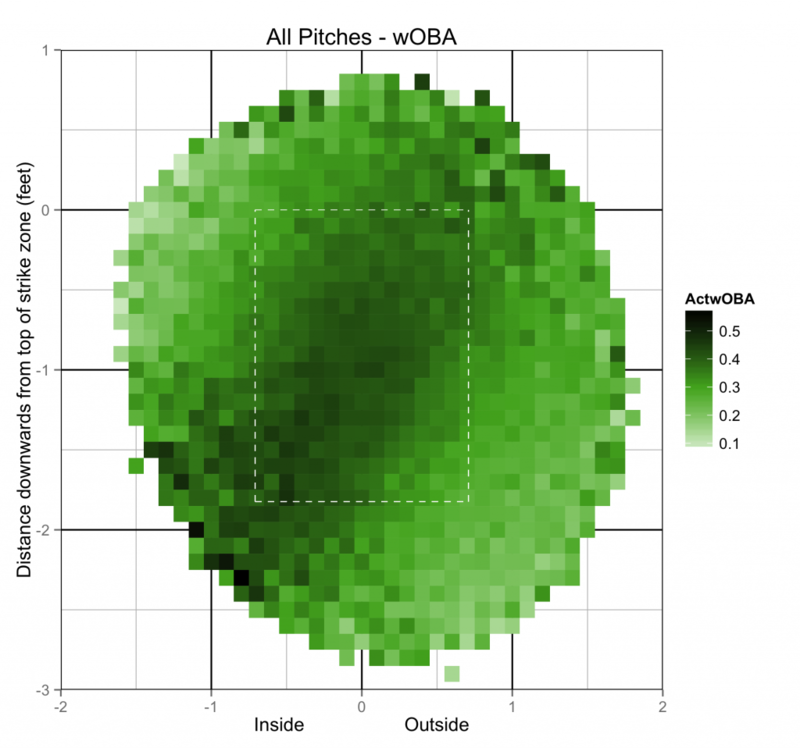 Last year at The Hardball Times, Noah Woodward went looking for the hallmarks of a perfect fastball. What he found is that the perfect fastball has a different definition depending on where it’s thrown. On the inside part of the plate, hard fastballs are far superior to soft ones, as one would suspect. 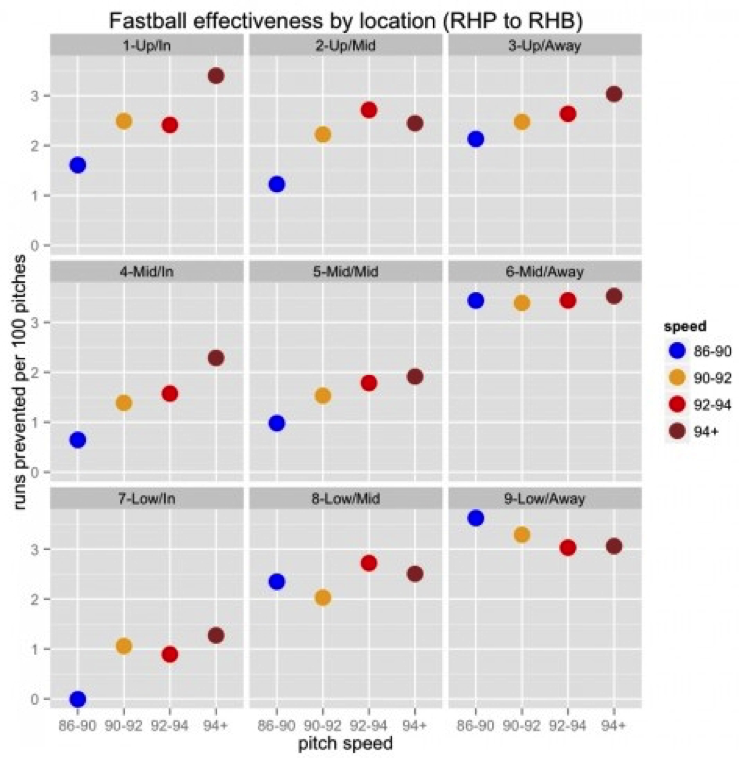 But down and away is the one area where soft fastballs are better. The Astros are painting the part of the zone where slow fastballs flourish. Woodward noted that on the outside edge, slow fastballs are called strikes more often than fast ones, which might help explain why Astros catcher Jason Castro rates as the seventh-most-valuable framer this season.3 The fact that they’ve found the perfect place to sneak slow fastballs by batters might be why the Astros’ results on four-seamers rate just above average, even though Houston is last in velocity and at or near the bottom in both vertical and horizontal movement. Nor does it hurt that the strike zone has migrated down. Maybe the Astros are actually targeting soft-tossers because they believe they’re undervalued — flamethrowers are expensive, and they’re more likely to break — or maybe they’re making the best of a bad hand. Either way, it’s working, although it’s an approach without much margin for error. Houston’s staff ground ball rate, which is second only to Pittsburgh’s. One caveat: These overall averages could be somewhat misleading because of the counts in which pitchers tend to aim for different areas. One team throws the fastest; the other throws the slowest. One throws the most inside pitches; the other throws the most outside pitches. But both are maximizing the strengths of their staff. The number of infield shifts the Astros have used this season, according to Baseball Info Solutions. No other team has shifted as often. The Astros are on pace for 1,578 shifts in 2015, which would break the record they set last year, with 1,341. BIS reports that they’ve already saved eight runs via the shift, which ties them with the Rays for the most in the majors. The percentage of balls in play that the Astros convert into outs, otherwise known as Defensive Efficiency. Last year, the Astros turned 70.1 percent of batted balls into outs, the 19th-best percentage in the majors. Their rate this year ranks fifth, which gives them the biggest increase of any team. Even in the high-strikeout era, when teams allow fewer batted balls than they used to, a defensive difference that big can mean 150 to 200 potential hits recast into outs over the course of the year. Almost 15 years after a seminal study at Baseball Prospectus drew attention to the role defense and randomness play in pitchers’ results on balls in play, we still haven’t totally untangled the division of responsibility between pitchers and fielders. Have the Astros been better because of the personnel changes they’ve made, including the upgrade from Dexter Fowler to Jake Marisnick in center? Is it the weak contact induced by their pitchers, resulting in easier opportunities for the defense? Or is it the extra shifts, combined with the staff’s ability to get ground balls? The best answer is an unsatisfying “all of the above.” Whatever the primary reason, though, the result is the same: The Astros have become one of the best defensive teams in baseball. The Houston bullpen’s ERA-, a park- and league-adjusted version of ERA in which 100 is average and below is better. Last year, the Astros had the worst bullpen in baseball by ERA- (126), and one of the worst by any alternative metric; only five other bullpens during the wild-card era have been worse. A cautionary note: The best bullpen of the wild-card era, which featured Eric Gagne in his 2003 Cy Young year, posted a 61 ERA-. The 2015 Astros don’t have the new best bullpen. But they do have this season’s highest strikeout rate and lowest walk rate in relief. As small as the sample is, and as variable as bullpens can be, last year’s crew couldn’t have faked that type of performance for close to this long. Over the winter, the Astros signed Luke Gregerson, Pat Neshek, and Joe Thatcher; claimed Will Harris off waivers; and brought back six other players who’ve appeared out of the pen. So far, those 10 pitchers have combined to post the same ERA- that Aroldis Chapman gave Cincinnati last season. That stat will expire soon, possibly by the time you read this sentence. Still: The worst bullpen of the past 20 years belonged to the 2007 Devil Rays, who won 66 games. The 2008 Rays, with an above-average bullpen and a way higher Defensive Efficiency, won 97 games and a pennant. The Astros’ overhaul isn’t going to work that well, because that was the kind of comeback that people write books about. But if it works half as well, the Astros could end up with a wild card. The Astros’ Baserunning Runs, the third-highest sum in the majors. Houston leads both leagues in Stolen Base Runs (one of BRR’s components), thanks to an MLB-best 33 steals and 85 percent success rate. In addition to continued base-stealing brilliance from Jose Altuve and George Springer, the Astros have gotten a 9-for-10 performance from Marisnick, who’s attempted a steal in a third of his opportunities — the highest non–Billy Hamilton rate among players with at least five steals. The Astros also rank third in Hit Advancement Runs, which reflects their high Extra Bases Taken Percentage. Astros runners have advanced more than one base on singles or more than two bases on doubles in 47 percent of their opportunities, well above the 40 percent league average. The percentage of the Astros’ fly balls that have left the park, which ranks second only to the Dodgers’. Over time, extreme HR/FB rates tend to regress to the league average (about 10 percent), with some fluctuations by ballpark. Only one team on record, the 2012 Yankees, has sustained a rate above 15.0 percent for a full season, and of the Astros’ AL-leading 41 homers, 22 (53.7 percent) have been labeled “just enough” by ESPN’s Home Run Tracker, signifying that they barely cleared the fence.5 So while Minute Maid Park helps home run hitters, it’s tempting to dismiss the Astros’ big-fly barrage as unsustainable. The league-average percentage this season is 34.8. When they’ve elevated — and they usually have, because Houston’s batters have the lowest ground ball rate in baseball, the polar opposites of its pitchers — the Astros have hit the ball hard. They’ve had their share of fence-scrapers, but that’s partly because they’ve hit them toward deep parts of the park. Houston is a team built for high strikeout rates and high slugging percentages, and it looks like the Astros are going to deliver on both counts. Although their flies will almost certainly stop clearing the fences with such frequency, it won’t be because they’ve lucked out by hitting a bunch of wind-aided warning-track balls by the foul pole that bounced off an outfielder’s glove (well, aside from that one time). It will be because teams eventually stop throwing them strikes, or because they’ll get just a little less locked-in. The combined park-adjusted batting runs below average of Springer, Evan Gattis, and Chris Carter, the Astros’ Opening Day second, fourth, and fifth hitters. Thus far, the offense has been buoyed by Altuve, who’s picked up almost exactly where he left off last season; Jed Lowrie, who was hitting .300/.432/.567 when he tore a thumb ligament that will keep him out until the All-Star break; a bounceback from Colby Rasmus, one of the winter’s best buy-low signings; and Marisnick, who in addition to his valuable baserunning and defense has hit .351/.395/.581. Physical maturation and mechanical fine-tuning have made Marisnick into more than the fourth outfielder he was formerly believed to be, but he’s bound to slow down. Fortunately for the Astros, his regression should be counterbalanced by improved production from the players who were projected to shoulder the load. I could add an 11th stat here (not that I’ve actually stuck to 10): .420. That’s the collective winning percentage of the other AL West teams — 27 points below the bottom four in the NL East, the next-worst division with its leader removed. Admittedly, the Astros have had something to do with their division rivals’ struggles: They’re a combined 14-8 against the Mariners, Angels, A’s, and Rangers. But the rest of the West is 39-51 against non-Astros teams, so Houston can’t claim all the credit for the competition’s collective slow start. Not all of those teams will founder for the rest of the season, but they all have holes to escape, which makes the Astros dangerous even if they falter too. Astros batters have had the platoon advantage in 59 percent of their plate appearances, the eighth-highest rate in the majors. Astros pitchers, however, have had the handedness advantage against only 45 percent of the batters they’ve faced — a lower rate than any other team but the Tigers. Of course, that’s partly roster construction: The Astros’ pen includes guys like Gregerson and Tony Sipp, who’ve had no platoon splits. Until 2015, Luhnow’s Astros barely had the raw talent of a 70-win team, let alone an 80-win one, so those extra wins were almost irrelevant. This year, though, they were projected to flirt with .500, which made every edge important. The projections still see them, probably fairly, as a roughly .500 team that’s been executing its game plan perfectly for a short period. But that .500 projection only applies as long as they stay the way they’re currently constructed. Houston’s minor league affiliates have more wins this season than all but one other organization’s, and while a farm system’s winning percentage isn’t always an indicator of its potential, it’s easy to see those (relatively) insignificant victories as precursors to more meaningful ones. Twenty-year-old shortstop Carlos Correa, who might be the best prospect in baseball, is hitting .382/.457/.706, with 13 steals and no times caught stealing, in the Texas League, with a promotion to Triple-A fast approaching and the major leagues looming if Lowrie is slow to return. The back of Houston’s rotation is a liability, but it should also be easy to upgrade — either internally, with Double-A prospects Mark Appel and Lance McCullers, or on the trade market, where the Astros seem ready to raise baseball’s second-lowest payroll. These Astros, still in large part the product of ex-GM Ed Wade’s regime, aren’t quite the ones we’ve been waiting for. And given how closely we’ve watched their slow stirrings since Luhnow arrived, it seems strange that their first successful season could come as a surprise. But the Astros renaissance is picking up speed like a sneaky-fast Sir Lancelot, and Houston’s first contender might be upon us before we’re prepared.